I have a few announcements to make. On Cyber Monday, I bought an Instant Pot. We are starting a HUGE remodeling project. Now, let me pause and add some back story. Then, on New Year’s Eve I made short ribs. They were pretty amazing. Most recently I made this pot of beans. They were almost prep free and basically instant if you consider I was using dried beans. 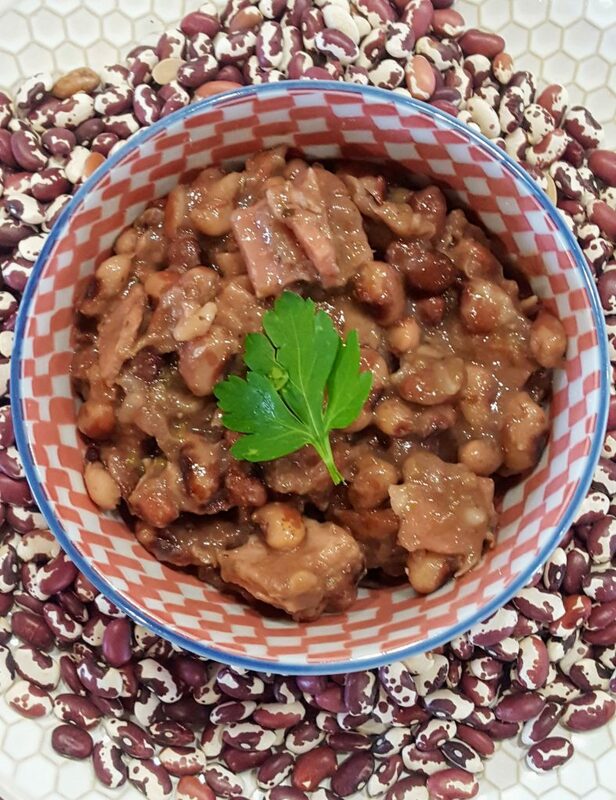 I had a surplus of Anasazi beans in the pantry and I used some of the roasted green chiles that I have in the freezer along with some long-ago-forgotten frozen ham. Everything else came from the pantry so this was an easy meal. Place dried beans, crushed garlic cloves, chicken stock, water, cumin, oregano, bay leaves, green chiles, and dried onion in instant pot. Close lid and pressure cook at high pressure for 25 minutes, then pressure release for roughly 15 minutes. Open the lid carefully. Add ham and switch pot to soup setting. Stir occasionally for about 10 minutes. Taste and season with salt and pepper. Serve. Optional garnishes include jalapeno slices, a dollop of sour cream, salsa, or all three. These Anasazi beans came from the Taos farmer’s market. It’s a good thing that dried beans virtually last forever because it has been some time since we traveled to New Mexico. The provenance of the beans is what prompted me to throw in the Hatch green chiles. Anasazi beans are an heirloom variety named after the mysterious Anasazi (“The Ancient Ones”) tribe. Ancient remains of these beans have been found in the Four Corner area of the United States and were probably one of the few crops cultivated by the Anasazi tribe. 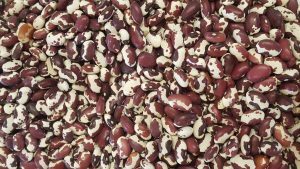 These beans have a quicker cooking time than pinto beans and they make great refried beans or burrito stuffings. (See my Heirloom Bean Burrito with Goat Cheese and Romesco Sauce.) It is also said that they cause, ahem, less gastro-intestinal disturbances. This dish made a quick meal as we embarked on our remodeling process. Our house is about twenty years old. When we built the house, I decided that a light colored berber carpet would be just the thing. Seriously? The carpet is so dingy now that I never turn on the living room lights when we have guests. (I use a lot of candles. ) We have been toying with the idea of extending the hardwood floor that separates the living room and the dining room into both. We pulled the trigger. In preparation for the floor layers, we decided it would be a good time to paint the dining room. To further complicate things, we then decided to have hardwood laid in the guest bedroom that is one day destined to become my library. While moving furniture out of that room (which now serves as my make-shift office), we decided to tear out the closet and expand the room before the floor installers came. This meant tearing out sheet rock, putting a new header in the wall, raising the casement of said closet, and cutting out walls. Deconstruction in progress…dining room before…possible paint colors. Anywhoo, I don’t know what I’m more excited about…the hardwood floors or the emerging library project?!?!?!?! And speaking of libraries. Of course, I had to clean out all the book cases in the bedroom to move out while we cut out walls and got ready to rip out the carpet. Do you know how many books I have? 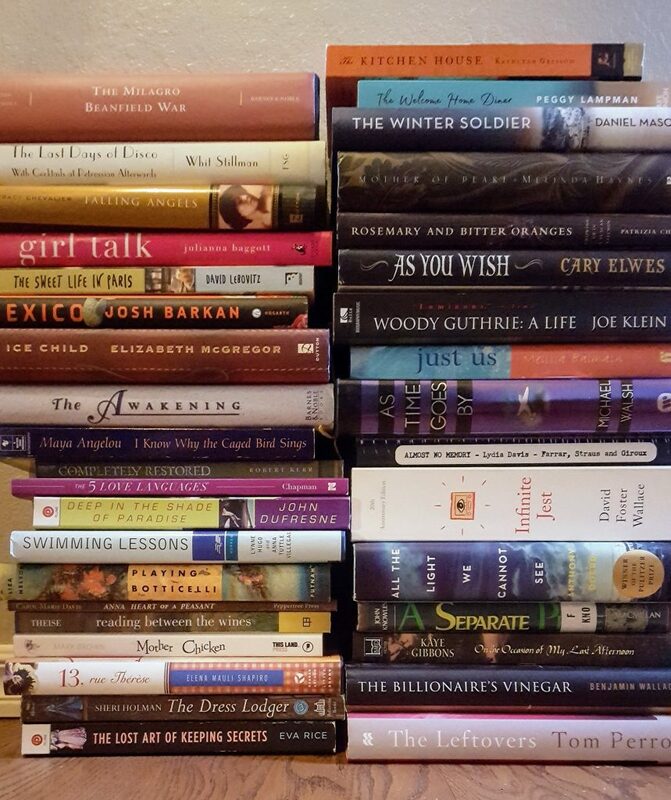 Even after I filled a huge tote bag for my best reader friend and took a box to Goodwill, I still have hundreds. (I’m afraid to actually count them.) I also found these books. Can one really have too many books? There’s thirty-five in this stack alone. My 2019 Reading Challenge is fifty books. This stack of 35 should get me on my way, right? I’m linking this rant up with Deb’s Souper Sundays. There’s always delicious soups awaiting on her blog, Kahakai Kitchen. The IP beans look so comforting and creamy. All the best with the renovation, Deb. 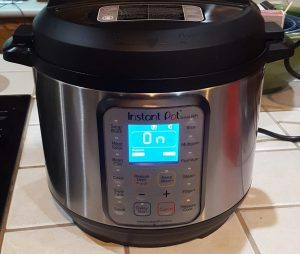 Even though I see lots of delicious dishes using an instant pot, I just have to resist them. Not enough room. 🙂 Your beans look like a pot of beans should and with that ham and green chile, I’m sure they are tasty. Happy remodel!!! Glad you had good results with your IP! I threw mine to the curb, way too many problems with it and I couldn’t wait to get rid of it. But your dish looks really delicious! Too many books? Yes, we have a great store nearby that buys used books so that’s where I’ve taken a lot of ours. Unfortunately, I mistakenly sold them a couple that I, months later, re-bought! Good luck with your remodeling! Berber carpets are cool, but they don’t really wear that well, alas. Good luck with the remodeling — big job, I know. And nice recipe! I’m still really on the fence about an Instant Pot, but this looks like the ideal use for it. Thanks! 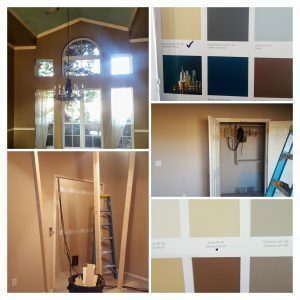 Remodeling can snowball out of control. I hope your project goes smoothly and works just as planned. Our house was built in the 1920s so every remodel is full of big surprises. Thanks for sharing with Souper Sundays!